Please welcome, novelist, Gina Holmes. Gina is the founder of popular literary site, novelrocket.com. She is a two-time Christy and ECPA Book of the Year finalist and winner of the INSPY, Inspirational Reader’s Choice, and Carol Award. Her books regularly appear on Christian bestseller lists. 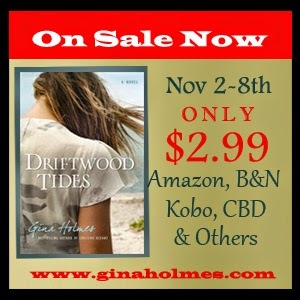 Gina, tell us a little bit about your newest release, Driftwood Tides. Driftwood Tides tells the story of an aging, alcoholic driftwood artist turned beach bum, Holton Creary, and young Libby Slater. Libby grew up with an absent father and a loving but cold, socialite mother. Leading up to her wedding, Libby and her groom-to-be go through genetic testing and she learns her blood type doesn’t match either of her parents. She confronts her mother and is reluctantly told that she’s adopted. She goes searching for her mother, Adele, only to find her husband, Holton Creary lying face down on the carpet of his Nags Head beach shack. She lies about her real identity until she is finally found out. Holton does not welcome the news. He never knew the wife he had given saint status too had given up a daughter for adoption. Together the two search to find the truth about Adele, Libby’s father and themselves. 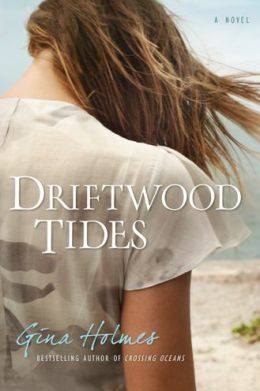 At its heart, Driftwood Tides is really about discovering who we are, whose we are, where we belong and the need to accept and bestow forgiveness. Why did you set the novel in Nags Head? You seem to have a recurring theme in your novels about absent fathers, if it’s not too personal, why do you think that is? It is too personal, but I don’t mind answering (wink!) When I was 6 years old, I was packed up by my stepfather and driven to my father’s house. Overnight I had a new Mom, new sisters and brother, house and life. It was as traumatic an experience as I can imagine. There were few explanations that made sense to me and I missed my other family desperately. I think ever since I’ve been trying to settle some pretty deep-seated questions. Writing books is wonderful for that. The novel you’ve written that seems to be a fan-favorite is Crossing Oceans, do you ever see yourself writing a sequel? I love that book too. Makes me cry just thinking about certain scenes. I would love to write a sequel, prequel or off shoot stories. I love those characters dearly. I’m under contract for three different novels, so I’m not sure when I’ll have the time, but I’d love to explore Craig’s story and of course, Bella’s. I miss Mama Peg very much! You’ve said that your favorite novel you’ve written is Wings of Glass. Why is that your favorite? Well, for storyline, I think Crossing Oceans is the strongest. I think my writing in Wings of Glass was my best, plus when I was very young I watched my mother in one abusive relationship after another, and then two of my sisters. I had been there too, despite thinking I was better than that. I know the mindset that keeps a woman (or man) in a relationship like that and I wanted to give insight to those who don’t understand. I’ve received enough letters to know I did what I set out to do. You’re originally from NJ but write all your novels from the South, why do you set your novels down South if you’re from up North? What do you like most about being a writer? Least? Most, I like being able to have a platform to share lessons I’ve learned in my life that I know others would benefit from. And more than that, I just love to tell a good story. My advice is pretty much always the same. 1. Write. So many people want to have written but don’t actually do the work. 2. Get to a writers conference because there’s so much you don’t know, that you don’t even know you don’t know. If you don’t you’ll be spinning your wheels for years, wasting valuable time. 3. Run, don’t walk, to the nearest bookstore and buy yourself a copy of Self-Editing for Fiction Writers. Then apply it. (Best money I ever spent!) 4. Join a good critique group and get a nice thick skin, ‘cause you’re sure going to need it! If you could go back to the pre-published writer you were, knowing what you do now, what advice would you give her? Well, I wouldn’t have told myself how many novels I’d write that would never see the light of day, because I would have given up. I wouldn’t have told myself how little money there is actually to be made or how lonely writing can sometimes be. I wouldn’t have told myself that I’d still have a day job with 4 novels out in stores, including 3 bestselling novels… okay, but that wasn’t your question… I would tell myself to relax. Some of this, most of this is, is out of your hands, and that’s okay. It’s not going to be at all what you think it is, but it’s going to be so much more. You won’t get rich, but you will touch lives. At the end of the day, that’s going to be exactly what will fulfill you. Where can readers find your books and more about you? Thanks for asking. My books are in B&N, BooksaMillion, Amazon, Lifeway, Parable, Family Christian and hopefully a good number of independent bookstores. You can find me at Ginaholmes.com. Thanks so much for hosting me!